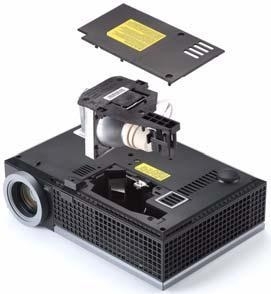 VIVID Projector Lamps manufactures Genuine Inside projector Lamps. VIVID uses the same bulb as the original projector manufacturer. This guarantees identical performance but at a lower cost. VIVID lamps are also known as 'Genuine Inside' lamps. This means all VIVID lamps are fitted with a genuine bulb in a compatible housing (3rd party). VIVID lamps have exactly the same bulb as the projector manufacturer’s use in their projectors. 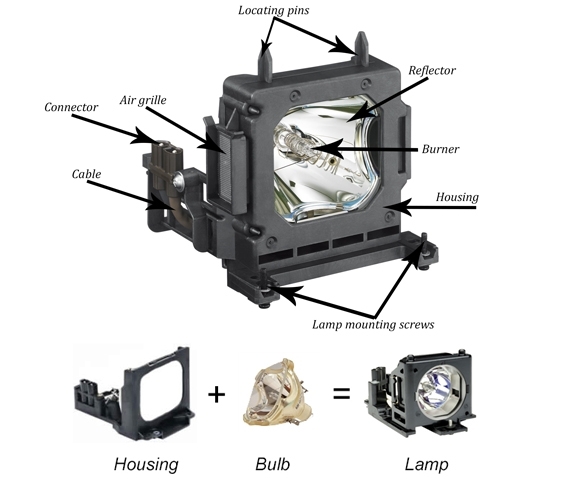 The major manufacturers in the projector lamp industry are; Philips, Osram, Ushio and Phoenix. One major shock for customers who need to buy a new lamp is the cost. To help keep costs to a minimum, some projector manufacturers have teamed up and use the same lamp in all of their projectors, so the same lamp could fit several models and manufacturers’ projectors. VIVID lamps offer the perfect balance. This means you need not have to pay what can amount to hundreds of pounds more for a genuine lamp without compromising on quality. Every VIVID lamp carries a genuine bulb, exactly the same as the original manufacturer uses, so peace of mind without the expense. All VIVID lamps are guaranteed to offer exactly the same level of brightness (Lumens) and lamp life as the Original manufacturers’ lamp. However, depending on how your projector is handled, or serviced etc., will determine how long your lamp will actually function for. Modern projectors will also have a built in timer to keep track of how long the lamp has been in use. The timer will eventually reach a certain point and display a message on your projector screen, or you may notice, over time, the lamp is not as brilliant as it was when you first installed it. These are warnings indicators that you may have to start looking into buying a new lamp. Never unplug your projector immediately. Most projectors have an internal fan that continues to run even though it’s been switched off. Always allow it to cool down before unplugging. We suggest you leave it plugged in for at least 15 minutes before unplugging. Avoid switching the projector on and off repeatedly, this can cause the lamp to fail prematurely. Avoid moving the projector when it’s in use, or cooling down after use. Hot lamps are very fragile, any shock movement or vibration may cause the lamp filament to break. Clean your projector on a regular basis. Especially the filter, blocked filters can make the lamp overheat and fail far sooner than they should normally. Always ensure the power cord is disconnected before attempting to clean any part of the projector. Use a vacuum cleaner and the use of compressed air to blow out and trapped dust and debris. Change the filter if it cannot be cleaned. Use economy mode whenever possible, this can considerably extend the life of the lamp. Never obstruct and air vents, and ensure there is sufficient space around the projector for air to enter, and leave, the projector. Never touch any part of the bulb with bare hands, wear gloves. Oil and deposits on your hands and fingers can hot spots, which will lead to early lamp failure. Test a new lamp for approx. 10-20 hours shortly after purchasing it. Most failures will occur within the first few hours of operation. Most projector bulbs contain highly pressurised chemicals required to create the very bright light we expect from a projector bulb. One particular chemical used is Mercury, a highly toxic heavy metal. Please be responsible. You MUST recycle your old projector lamps according to your local council or environmental health department’s guide on how to dispose of products that contain mercury.